Irrespective of the pupil’s diagnosis and prognosis, the assessment unfolds the pupil’s individual Number Sense Developmental Profile based on their unique neuro-diverse profile. The assessment provides a Number Sense Developmental Profile that identifies if the pupil is at risk of developmental dyscalculia or maths developmental delays and informs of the specific areas of strengths and needs. Dynamo Intervention takes a developmental approach, where the learning of specific skills takes an integrated approach using three pathways (Triple Pathway): Lesson Plans, Online Activities and Worksheets. Each pathway is structured in small, cumulative steps of number development ensuring consolidation and confidence building before higher numbers are introduced. Its strength lies in the way it offers multiple engagement routes so that the same skill is learned and consolidated in different ways whilst harnessing the pupil’s senses, emotions, verbal, visual, auditory and kinaesthetic skills. It provides the interventionist multiple opportunities to see where the barriers lie so that the teaching approach can be precise and continuously shaped by the pupil’s responses. The multiple pedagogies and the dynamic interaction between the pupil and the interventionist will promote a warm, engaging and cordial flow of communication. This lays the building blocks of developing the necessary inquiry, language, reflection, investigative, thinking and reasoning skills to secure number sense development. The use of the Support Tools within this integrated approach of observing the pupil’s engagement within the Triple Pathway ensures that the goal towards mastery is never lost. Dynamo Intervention is a positive program aimed at shaping and re-positioning areas of uneven number sense development and keeping the pupil on track because any weakness at this level will hold them back. Why Do Some Pupils Have Significant Difficulties with Early Maths? co-occurring difficulties such as dyslexia, dyspraxia, working memory impairments, auditory processing difficulties, sensory motor challenges, visual challenges, losing focus, inattention, impulsivity, etc. These co-occurring difficulties also vary in their levels of complexity. biological conditions determined by the pupil’s genes. Dyscalculia – a formal diagnosis by an educational psychologist using a variety of psychometric tests. sensory conditions where the sensory integrative capacity of the brain is insufficient to meet the demands of foundational maths. Educational Psychologists use Dynamo Assessment in addition to other tests to support their understanding of the pupil’s Number Sense Developmental Profile. environmental deprivation – access to schooling or relevant number developmental activities. poor teaching – mediation of how numbers have been introduced to the pupil. curriculum that is moving too rapidly – conceptual number sense development is not consolidated. the pupil’s early warning signs were not identified and addressed using a systematic approach – preventative approach of identifying early signs to close the gaps in learning during the pupil’s formative years. Dynamo Maths Assessment has been developed from research and learning from neuroscience, assessments, early childhood development and education. Age: Assessments can be used for pupils between the ages 6 to 15. 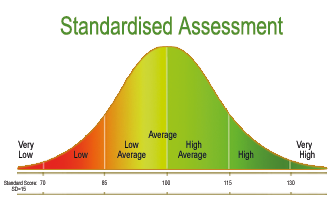 The standardised assessment is baselined for ages 6, 7, 8 and 9. For pupils above the age 9, age 9 baseline will be used. Administration time: The assessment can be administered online and takes approximately 30 minutes. Whilst this is a guideline, the time taken is driven by the unique neurodevelopmental profile of the pupil. to capture a pupil’s number sense developmental profile. and to identify areas of strengths and the specific areas of number sense development. Period: The assessment lasts 365 days and schools can re-assess up to four times during the year to compare Before and After scores. 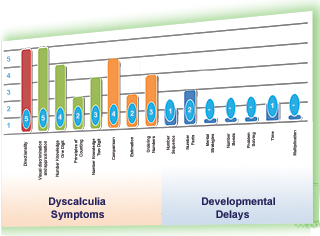 Dynamo Maths Assessment can be used to screen pupils for symptoms of dyscalculia and as an early preventative tool so that pupils can be supported during their early formative years. The strength of Dynamo Assessment lies in the way it captures and profiles the pupil’s individual variation in their number sense development. It enables pupils at risk of developmental dyscalculia to be identified and serves as a basis for tailoring an individual and purposeful intervention. This individual-difference approach used by the Dynamo Maths Program is proving that children with developmental dyscalculia are making significant gains. Dynamo Maths Assessment is a dynamic, standardised, online assessment that has been developed to identify pupils at risk of developmental dyscalculia using the NumberSenseMMR® framework. The scores in the assessment are reported within three areas: Meaning, Magnitude and Relationship. 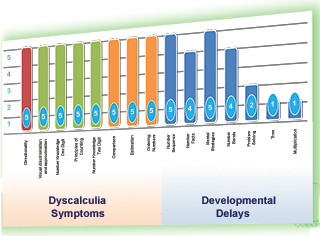 The Meaning and Magnitude scores indicate symptoms of Developmental Dyscalculia and the Relationship score indicates Maths Developmental Delays. Framework Validation: The study by the University of Oxford (Dowker, 2016) conducted an entry-type multiple regression analysis on the three stages of the NumberSenseMMR® framework. Assessment Validation: The psychometric validation procedure used a large data sample of 3465 pupils from 368 schools in the UK (2014-2015) and representing a population of 72,000 pupils. The test results are presented in three simple and easy-to-use reports. These reports, which bring all the assessments results and supporting information into one complete SEND report, can be presented to the stakeholders to support the Intervention strategies. The Number Relationships: this provides focus areas for developmental delay in maths. 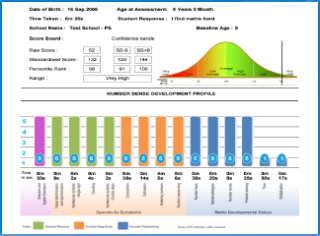 The individualised Number Sense Developmental Profile shows pupil’s strengths and specific areas of development. It also differentiates pupils at risk of developmental dyscalculia from those with maths developmental delays. a description on the area assessed. a performance commentary on the score achieved for each area of assessment. signposts to the multi-sensory triple-pathway intervention and remediation modules in Dynamo Intervention. The school assessment allows the pupil to be re-assessed so that the pupil’s number sense change in profile can be monitored. This is hugely empowering for the interventionist, pupil and parent as development and progress is visible through the Number Sense Developmental Profile. A small change in the profile indicates clearly the level of intervention that has taken place. Profiles can change, they can move up or down. When progress is not sustained, the profile will reflect this. Best practice shows that typically a re-assessment should be carried out after a 12-week period. Integrated within the assessment are Support Tools that ensure that the pupil’s developmental profile is captured so that the necessary adjustments to access the assessment can take place. Tools to capture observations during the assessment are included along with a template for pupils to record their working-out during the assessment. 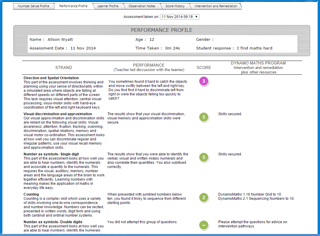 Student Profiler Questionnaire: captures the pupil’s developmental profile and engages all stakeholders. Observation Notes: a tool and guidance notes to capture observations during the assessment. Working-out Notes: a printable template to allow children to show their working-out. Resource Utilisation: a tool to assist the Review process of capturing the fidelity to intervention. Dynamo Intervention is an award-winning, world-class Intervention, seamlessly linked to Dynamo Assessment. It delivers a personalised pathway of developmental activities in small, cumulative steps identified from the assessment. Its strength lies in the way it engages the pupil by providing multiple experiences so that the same skill is learnt, reinforced and consolidated in different ways. The pupil’s verbal, visual, auditory and kinaesthetic skills are drawn upon so that the pupil’s sensory pathways and emotions are fully involved and engaged. Age: The intervention program can be used for pupils from ages 5 and upwards to develop Number Sense and Foundation maths skills. Currently, the intervention program content, when mapped to the curriculum, is appropriate for ages 5 to 8. Intervention time: We recommend usage of between 15-20 minutes per day. Additional time may be required to deliver Lesson Plans on a one-to-one basis to secure skills using tactile activities. to support pupils at risk of dyscalculia. by teachers, specialists, advisers and education psychologists to support in the development of specific areas of intervention. to catch up and meet curriculum outcomes. to support pupils to develop foundation maths skills. Period: The intervention lasts for the period of subscription. All scores and reports are maintained during this period to show individual progress and areas of strengths and weaknesses. These resources are organised in small-step developmental activities that start from Number Sense development, leading to Numeracy Proficiency (Foundation Maths). The activities seamlessly confirm working memory and auditory association skills. Triple-Pathway Approach – Lesson Plans, Online Activities and Worksheets. This unique approach to intervention is guided and shaped by the pupil’s needs. The interventionist is guided by the program and its Support Tools so that multiple avenues of the pupil’s specific areas of challenges are explored and then directly supported. 300+ Ready-made Lesson Plans, written by experts in dyscalculia, with Printable Resources. The ready-made Lesson Plans include step-by-step instructions, aimed at developing understanding, building thinking strategies and boosting number confidence. Games and activities include concrete resources to familiarise pupils with mathematical language and relate maths to real-world experiences. The Lesson Plans use resources with prompt questions to engage, and enter into to-and-fro communication. They provide a social focus to strengthen the skills of thinking, reasoning, communication, language, self-evaluation, moderation and reflection. Easy-to-use Support Tools to measure and record the delivery of the Lesson Plans to mastery are integrated within the Program. 300+ online interactive module with visual models and images. The Online Activities use visual models and images supported by audio and visual stimuli to process what they see and hear. Instant oral feedback, child-friendly score reports and certificates provide a positive and motivating platform for self-reflection. The activities encourage the pupils into a cycle of success, learning, understanding, regulating and reflecting on their responses whilst boosting their confidence. They help the interventionist to observe the approach to the question, the understanding and application of mathematical vocabulary, number of attempts and time taken. The Online Activities, when integrated with the Lesson Plan and Worksheets, will help develop the specific skills to a mastery level. 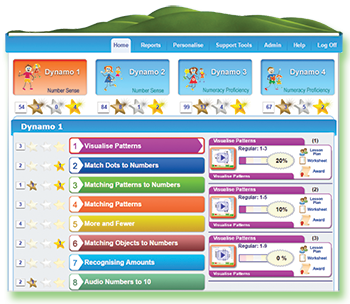 The Dynamo Worksheets support the Online Activities and Lesson Plans. Pupils have the opportunity to transfer, apply, retrieve and record their learning on paper. It helps the interventionist to understand and appreciate the pupil’s thinking, current skills knowledge and areas of number development that are compromising cognition and mastery. The Worksheets provide reinforcement, practice and feedback. They highlight to the interventionist written errors, procedures adopted, reflective approaches and ongoing refinements until an automatised and meaningful solution is obtained. Easy-to-use Support Tools measure and record progress on the Worksheets. They help track progress over time, identify trends and allow the interventionist to observe areas of difficulties so that they can be supported. The Worksheets, when integrated with the Online Activities and Lesson Plans, will help develop the specific skill to a mastery level. Three simple-to-use reports: Visual Report, Score Report and Intervention Report are automatically maintained. These can be exported to measure progress and performance. Maintains progress of the attainment score and time taken for each of the online activities. Provides further breakdown of scores and the option to print motivational certificates. Provides a progress summary of the specific skill development over time towards mastery. Dynamo Mastery Descriptor Matrix: Descriptors to identify where a student is in their skills development towards mastery. 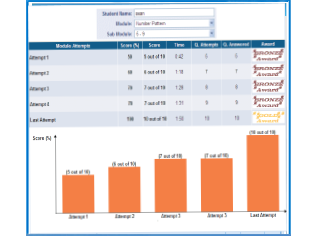 Monitoring Progress with Lesson Plans: Tool to assist in monitoring observations during the delivery of the Lesson Plans. Monitoring Progress with Worksheets: Tool to identify written errors, record observations on where the challenges lie and to chart progress. Quality Audit of Lesson Plan Delivery: Observation tool to provide feedback on the delivery of a Lesson Plan to establish the fidelity to intervention and to identify interventionist training needs.